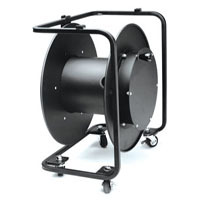 Cable Reels and Accessories at HAVE, Inc.
Cable reels are the greatest thing in the world for transporting, storing, spooling-out and spooling-in cables, in the field, studio, truck, or on stage. We offer really high quality reels in lots of different sizes and configurations, from Canare, Hannay Reels, Schill Reels, and OCC - Optical Cable Corp. NOTE: WE CAN CUSTOMIZE REELS AND LOAD THEM WITH CABLE ASSEMBLY CONFIGURATIONS OF YOUR CHOICE, RIGHT HERE IN OUR OWN SHOP. FOR CUSTOM LOADED REELS CALL 1-888-999-4283, OR USE OUR CUSTOM CABLE QUOTE REQUEST FORM!